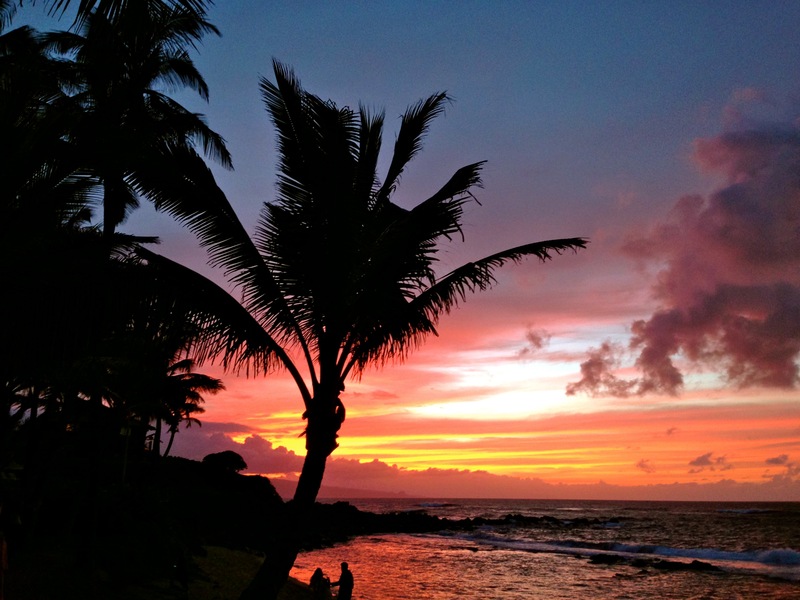 It has been a blast getting out of “Texas” and “Going Hawaiian Style” with all of you this week, and as the sun sets on this little adventure I want to thank everyone for their show of support and comments. For this last Going Hawaiian Style post I wanted to deviate from the upcoming Luau menu and share with you all a recipe that I consider the ultimate of Hawaiian Desserts and that’s a Coconut Cream Pie. As I said in an earlier post I love all things coconut and this Coconut Cream Pie hands down is my most favorite coconut dessert of all time and my Mothers favorite as well. I have tried coconut cream pies from just about everywhere and none of them ever compare to my Grandmothers. Some coconut cream pies have too much shredded coconut in the filling giving the pie a gritty taste. 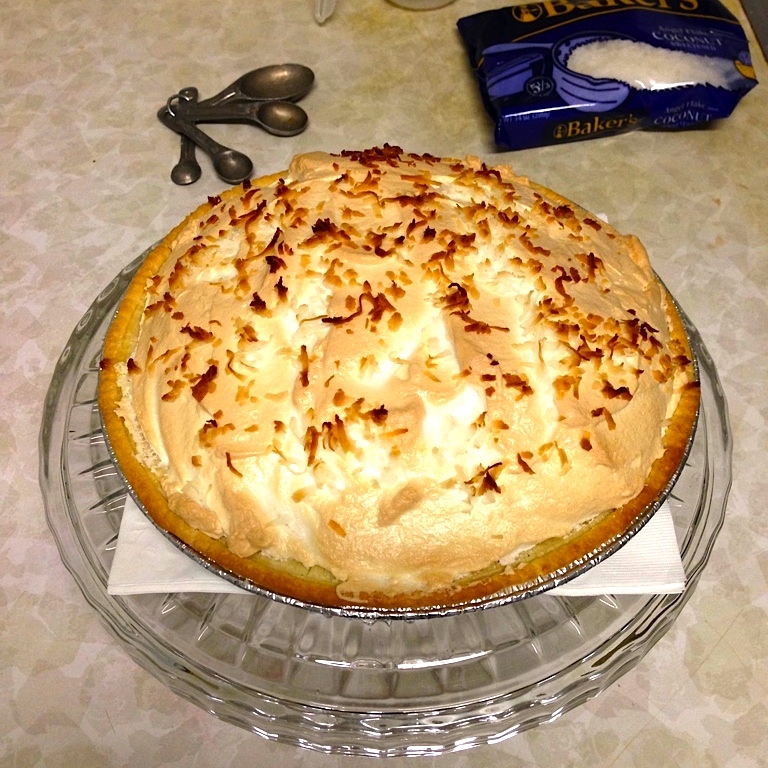 While other pies have so much meringue that the coconut filling doesn’t shine. 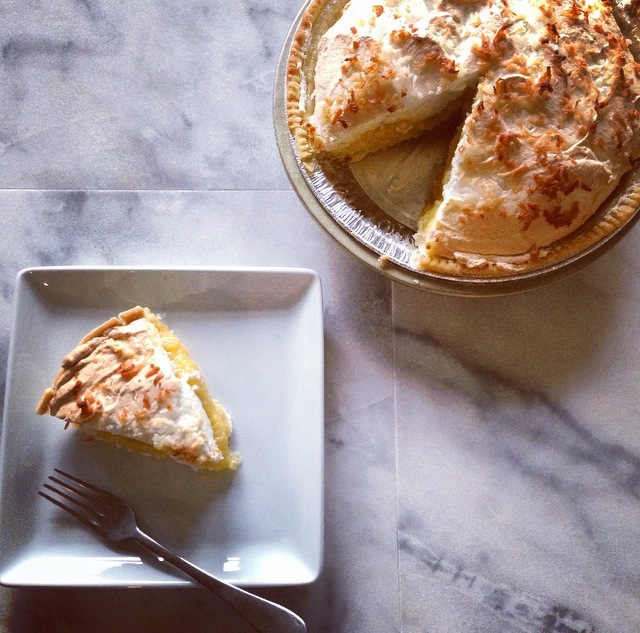 This Coconut Cream Pie is the perfect balance of coconut to filling, and filling to meringue. This past week I told my Grandmother I wanted her to show my exactly how to make her coconut cream pie and despite the pouring down rain she still made a perfect pie. We spent the morning reminiscing, laughing, making pie, and having a Grand Ol’ Time in the kitchen. 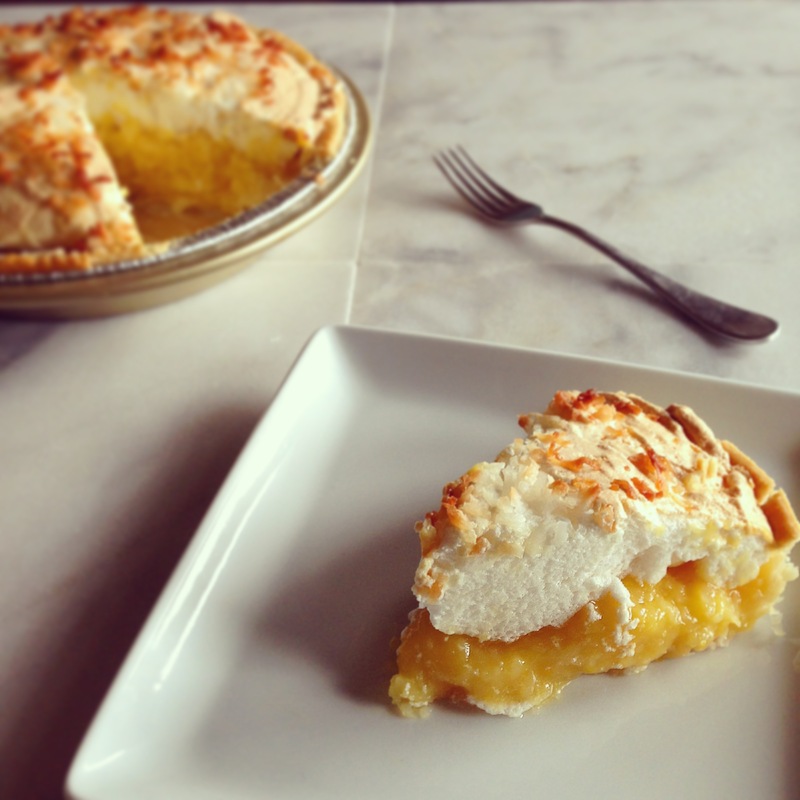 * When we made this pie it was pouring down rain and my grandmother said adding cornstarch in with the sugar will keep the meringue from weeping. Bake at 450 covered for 11-12 minutes until light golden, then uncover and bake for another 3-4 minutes. 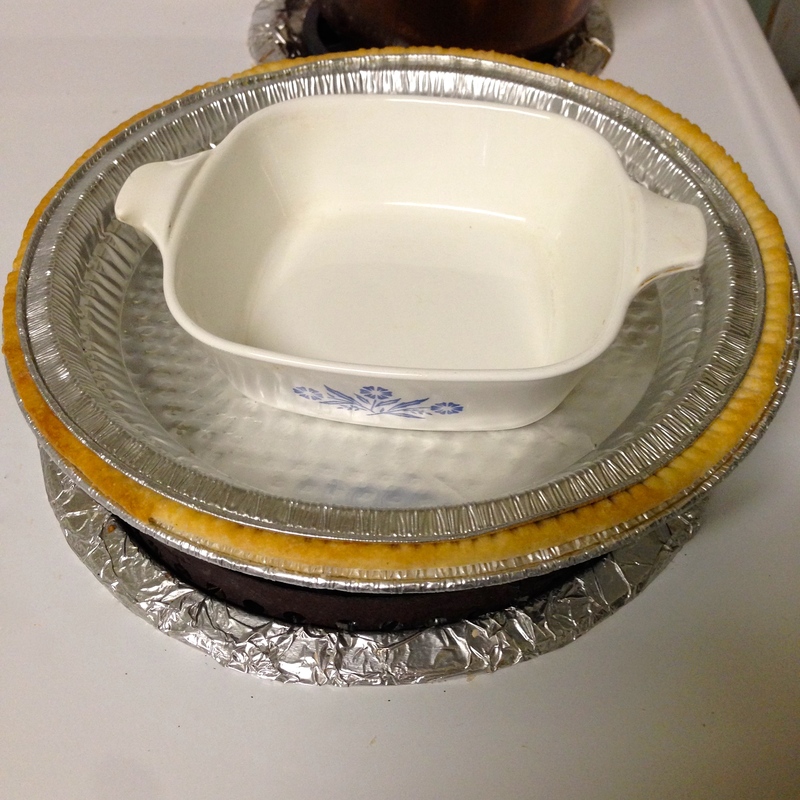 Remove the pie crust and set aside to cool. Reduce oven temperature to 400. In a medium sized sauce pan add 1 cup of sugar, 2 tablespoons of flour and the 3 egg yokes. Beat together with a spoon to form a paste then stir in the whole milk and the can of carnation milk. Cook over low to medium low heat, stirring constantly until the custard is very thick about 8-10 minutes. Remove from heat and stir in the vanilla and coconut. Set aside while making the meringue. In the bowl of a large stand mixer beat the room temperature egg whites until soft peaks form. In a small bowl add the 6 tablespoons of sugar and 1 teaspoon of cornstarch, stir to combine then gradually add the sugar/cornstarch mixture to the beating egg whites. Continue to beat the egg whites until stiff peak form. Pour the pie filling into the pre-baked pie crust and carefully spoon the meringue on top of the pie and smooth out with a spatula. 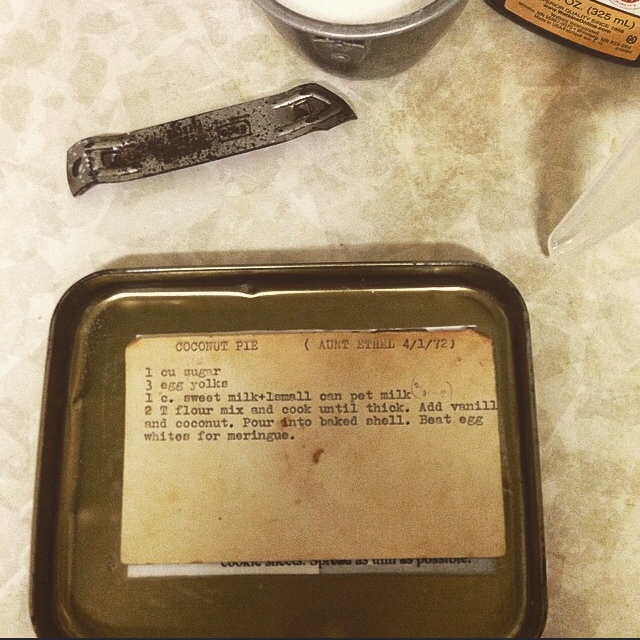 Sprinkle a little coconut on top of the pie. Place pie in center of the 400 degree oven. Reduce heat to 350 and bake until the meringue forms golden peaks, about 12-15 minutes. Your grandmother is precious!!! I LOVE her kitchen-the corning ware dish, her table, her foil covered burners on the stove-nostalgic happiness. I miss my Grandma Mae SO much-getting a glimpse of your wonderful baking fun was such a treat and brought back great memories. Thank you for sharing-and the pie is being made TODAY!!!! It was a really special day cooking with her filled with memories. Lovely post and amazing recipe.. It was a really special and memorable day for both of us. Thanks Kathryn, it was a fun day in the kitchen with her and it’s something we don’t get to do very often. I’m trying to get the Cinco de mayo recipe done but my brain is fried from Hawaii. It is wrong to need a vacation from a “artificial” trip? After cinco de mayo I think Meals With Mel needs a blogging vacation for a week. Honestly I don’t know how some of theses people find time to blog everyday. Once… Maybe twice a week I can do but everyday just about killed me. I was quite impressed Mel! My first month of blogging I posted each and every day. Then cut back to a few times a week, then twice. Lately, I am hard-pressed to even get one out a week! OY! Don’t stress Mel, I can always search your archives for inspiration. Hugs! You’ve found my weakness! This looks absolutely divine, and if it came from Grandma, then you know it’s gotta be good! 🙂 You can always trust in Grandma to cook the “Good Stuff”. This look luscious Mel!! Summertime recipe– and I love the old browned 3×5 card with the recipe on it. Looks like some I have from my mother. Great Post! What a delicious-looking pie, and what a sweet (pun intended!) post! I love that you took photos of your grandmother in the kitchen – I’m not sure why I’ve never thought to do the same! 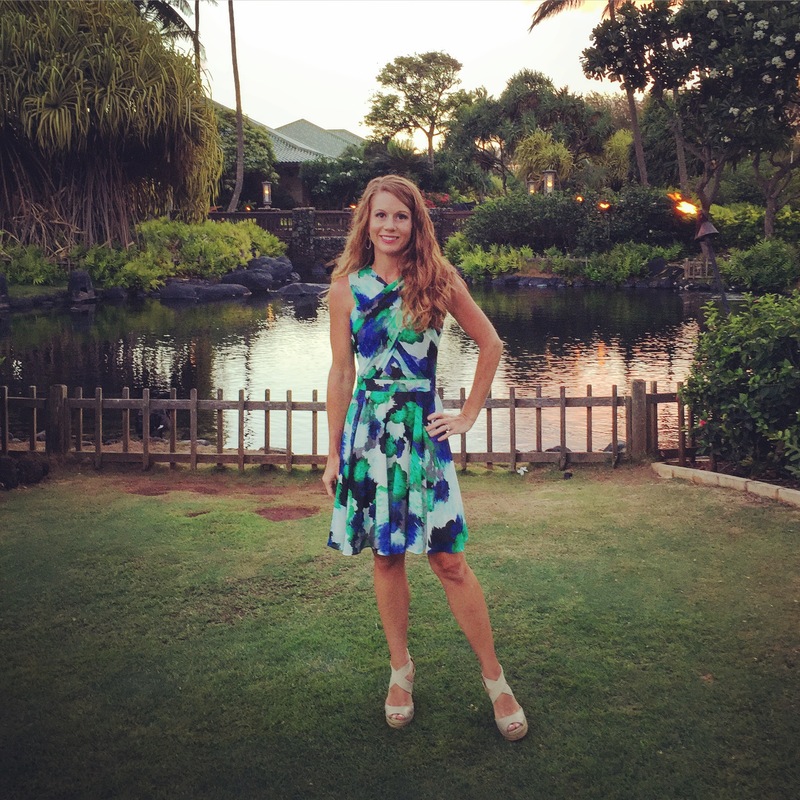 This is such a lovely post from the author of Meals With Mel. 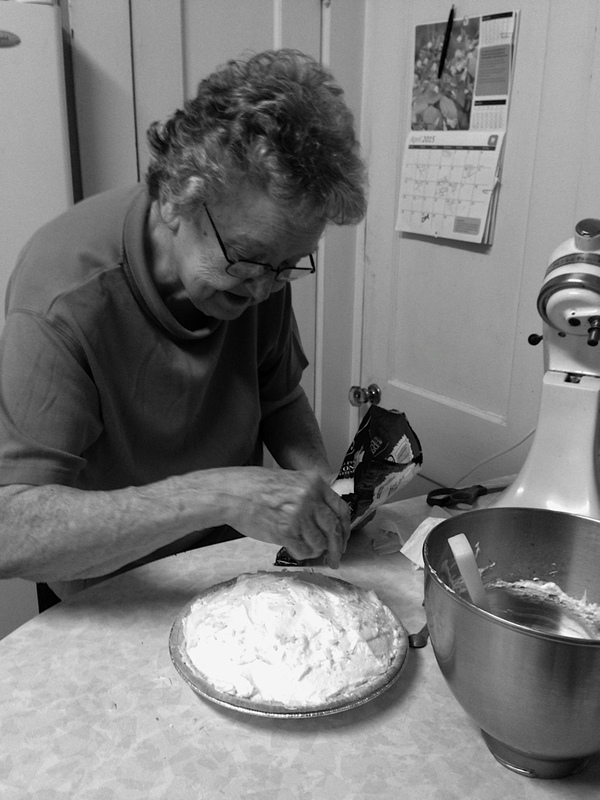 Mel and her beloved grandmother give us a lesson in making a coconut cream pie. Enjoy! I really enjoy how you used b/w photos of your grandmother in her kitchen and ended with the full-colour shot of that pie. You are a lucky girl to have such a day! 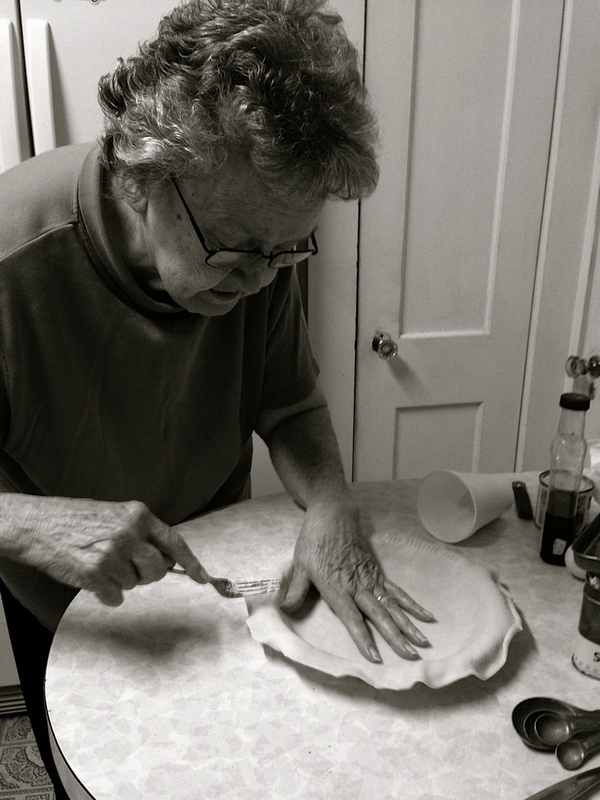 Any recipe that involves a grandmother is going to be a winner for sure! 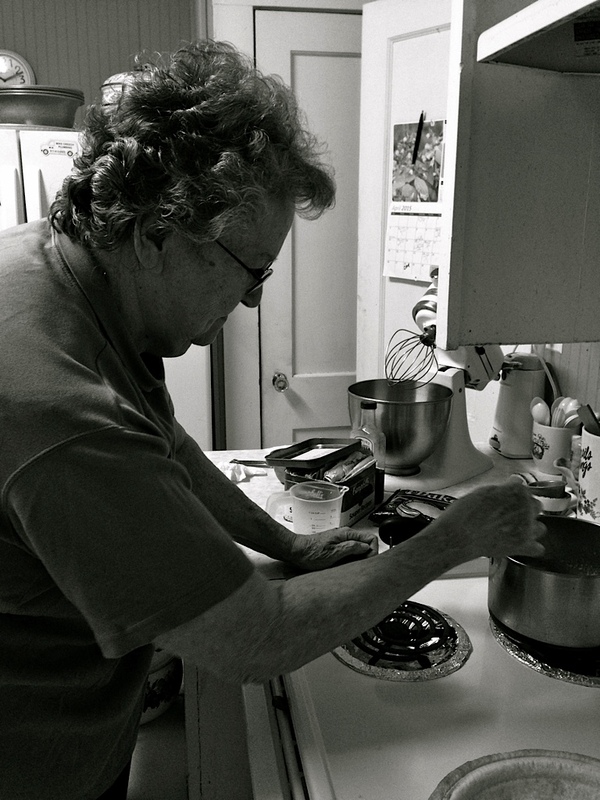 I have so many fantastic memories of time spent in the kitchen with my Grandma. This looks great! Grandmothers are a wonderful thing. I’m passing this one on to my daughter and granddaughters – all happy bakers! – and hoping they’ll enjoy both the post and making the pie. Thank you! I hope ya’ll enjoy 🙂 There is nothing like baking with family. I adore old recipe cards! and what a wonderful way to connect with your grandmother! 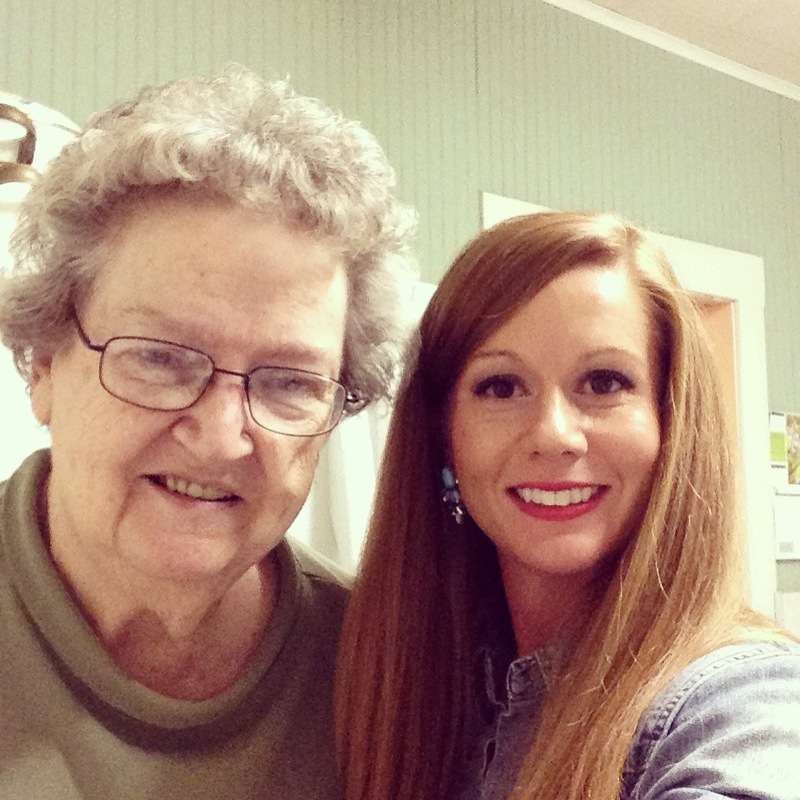 Food is such a wonderful way to bring family together, and I’m sure she loved spending the time with you too! Thanks Cristina 🙂 Happy memories and pie… it doesn’t get better! Yes, that coconut/meringue balance is crucial. Sounds like you’ve nailed it! I love the pictures of your grandma making the pie with you. What a treasure this will be for generations to come! Can’t wait to try it!